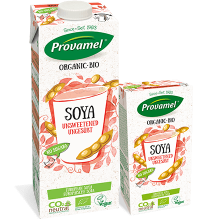 Put the oat bran, Provamel Soya Raspberry-Vanilla Yogurt Alternative, Provamel Soya Drink Natural, banana and half of the raspberries in the jug of a blender or smoothie maker. Blend for 2-3 minutes until well-mixed. Pour into chilled glasses and serve with crushed raspberries on top.